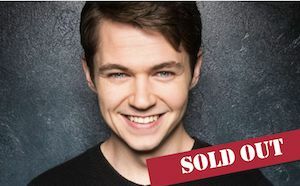 In less than a decade, Damian McGinty has gone from a virtually unknown singer in his local church choir, to an internationally adored singer and actor with a fan base almost ten times the population of his home town. 24-year-old Damian was born in Derry, Northern Ireland. His career began at the age of 13 when he recorded a charity CD, and his unmistakable talent and charisma quickly catapulted him into fame and success. Selected in 2007 by producer Sharon Browne and musical director Phil Coulter to join the inaugural cast of Celtic Thunder, Damian quickly became a fan favorite for his friendly charm and his deep baritone voice. In the time he was with the group, Damian performed in six specials for Public Television and completed four coast-to-coast tours of the U.S. and Canada, and Celtic Thunder sold over one million CDs and DVDs as well as over 400,000 concert tickets. Following his own advice to “Dream Big,” Damian took his career to the next level by auditioning for the Oxygen network’s “The Glee Project” in 2011. Out of 40,000 auditioners, Damian was chosen to appear on the show with only 11 other hopefuls. Alongside several castmates with exceptional talent, Damian’s work was cut out for him. Extreme dedication and an intense work ethic took him to the final four, and ultimately he was chosen as one of two winners. As a winner of the project, Damian landed a guest star role in Fox’s hit television series “Glee,” as foreign exchange student Rory Flanagan. Initially slated to appear in just seven episodes, Damian was so popular his role was extended to finish out the rest of season three. With fans clamoring for more, Damian self-produced an eponymously titled EP in late 2012. The 5-track album raced up the iTunes charts to hit #3 in the U.S. (as well as #1 in Ireland, Mexico, and Peru), selling more than 20,000 units to date. In spring 2015, Damian and his fans were delighted when he performed again with Celtic Thunder as a special guest on their “Very Best Of Celtic Thunder” tour. 2016 was one of Damian’s busiest years yet. He spent much of the year working on his first solo full-length CD, “This Christmas Time,” which he released in October. The CD reached #2 on Billboard’s World and Holiday charts, and the CD and individual songs were featured on numerous iTunes charts both national and international. Despite the long hours, days, and months spent recording and producing the album, he also somehow found time to travel to Australia to tour with Celtic Thunder in spring 2016, join up with them again for a 70-city North American tour in fall, and then set off on his own first solo tour to promote the Christmas CD. In early 2017, fellow Derry native, actress Roma Downey, and her husband, producer Mark Burnett, invited Damian to work with them on an MGM documentary to launch a new platform, meant to deliver “heart-centered” content, Light Works Media. The documentary will air fall of 2017. These days, Damian is hard at work in the studio, working on original songs for an album that he hopes to release in spring of 2018.